DragonHead Extract is a supplement made from the dragonhead plant (Dracocephalum moldavica), sometimes called ‘Moldavian Melissa’, which is traditionally used in Uighur medicine for combatting the aging process. With its unique mode of action and high content in flavonoid glucuronides, it mimics the effects of calorie restriction, an action that significantly slows down the aging process. In the short term, it produces benefits for the skin, while in the long term, it promotes longevity. It has a similar action to that of the exceptional anti-aging product Nicotinamide mononucleotide. 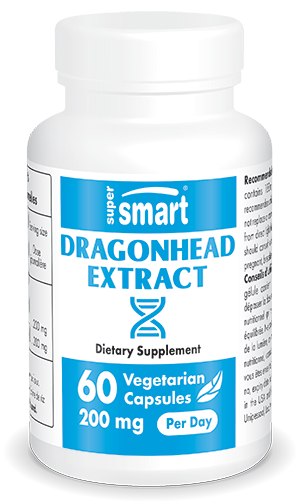 What benefits are offered by DragonHead Extract? Aqueous extract of Dracocephalum moldavica is distinct in being able to mimic calorie restriction, and as a result, may be able to push back the limits of human life expectancy and reduce the risk of age-related diseases. What exactly is calorie restriction and how does it affect aging? Calorie restriction is simply limiting one’s food intake to the minimum necessary. Until very recently, it was the only method known to increase longevity whilst improving general health (3-5). Calorie restriction activates a cell protein called AMPK (6-7) which itself triggers the expression of a family of genes called sirtuins (8-9-20). These genes slow down the aging process by acting on a number of cell mechanisms, such as DNA repair, resistance to oxidative stress and cell death. Studies also show that sirtuin activation increases insulin sensitivity and lipolysis, reduces levels of inflammation and plays a preventive role in neurodegenerative problems. But just how many of us would be prepared to make such a huge sacrifice? A lifetime of drastically reduced calorie consumption in order to increase one’s life expectancy holds little appeal for most people (even if, in the past, such diets were undoubtedly responsible for the incredibly long life expectancy enjoyed by Japan’s Okinawa islanders). 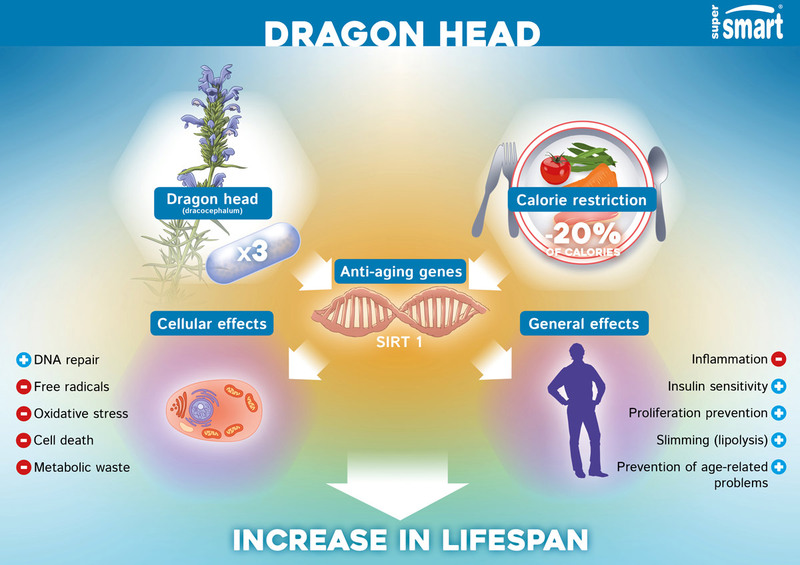 Fortunately, researchers recently succeeded in isolating natural compounds capable of reproducing the beneficial effects of calorie restriction, with dragonhead emerging as one of the most impressive resources. When humans and other animals are given extract of dragonhead, its flavonoid glucuronides activate AMPK in exactly the same way as calorie restriction. This brings about the same increase in activation of sirtuins, the genes that slow down aging. This results in both general benefits and cellular ones, with effects ranging from a decrease in metabolic waste products, to a reduction in fat mass. Accordingly, one laboratory study showed that the compounds in DragonHead Extract led to an increase of 400% in AMPK activity, and of 300% in FOXO transcription factors which activate the sirtuin family. Perhaps most surprising is that the beneficial effects of this molecule are even observed in cases of overeating (which is common in Western countries). With dragonhead’s ability to mimic calorie restriction, it’s therefore possible to have your cake (maximum life expectancy), and eat it too (normal calorie intake) and even have a cherry on top (a slim figure). It helps you slim down. It supports regeneration of the skin and improves a number of visible markers (elasticity, density, hydration …). One study examined 32 women in their fifties with sun-damaged skin. Following daily administration of 200mg of DragonHead Extract for eight weeks, dermal imaging showed a 14% improvement in hydration, a 7% improvement in elasticity and an approximate 3% increase in skin density (2). What exactly is Moldavian dragonhead? It’s a plant that has recently been rediscovered and positively exploited for its high content in glucuronic flavonoids, the compounds responsible for its many properties. It is indigenous to central Asia where it plays a prominent part in Uighur medicine. What is in DragonHead Extract? DragonHead Extract is produced from the aerial parts of Moldavian dragonhead which contain most of the active substances. The use of high-quality aqueous extraction produces an extract packed with active compounds such as flavonoids, terpenoids, steroids, glycosides and volatile components. Of all these ingredients, it is the flavonoids which are the most active. Several studies have shown the most important flavonoids to be tilianin, luteolin-7-O-glucuronides, apigenin and rosmarinic acid (15-17). But as in all plant extracts, it is really the synergy between the components which is key. Pharmacological studies have demonstrated the biological activity of this exceptional synergy: researchers have observed antioxidant, anti-hypoxic, immune-modulatory, anti-microbial, and vasodilatory properties (the latter accounting for its traditional use in treating heart and blood pressure problems (18-19). How should DragonHead Extract be taken? The recommended dose is two 100mg capsules a day, to be taken in between meals. PQQ & Q10, a synergistic formulation for fighting cognitive impairment (PQQ and co-enzyme Q10). Other ingredients: white rice flour, acacia gum. Each capsule contains 100mg of DracoBelle™. DracoBelle™, Mibelle, Switzerland.